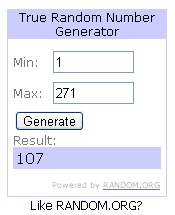 Last week, I made a giveaway in the hopes of getting to know my readers a bit better. I loved learning so much about you. Now I feel like you're just that much more real to me than just numbers on my stat counter. I especially enjoyed finding out those interesting factoids about you, definitely getting a chuckle out of some and enlightened by others. If I would go by the responses I got alone, I'd think all my readers were female, but I'll wager its just that many males who read this were just intimidated by all the women answering that they were too shy to speak up. I also confirmed my theory that most readers are moms and married, but I did enjoy seeing that quite a few of you are married or not yet moms but still find my blog relevant enough to be readers. I definitely appreciated those of you who shared details about their finances- their annual income range and frugality rating, as it helped me understand the socio-economic backgrounds of my readers just that much more. I'm really glad I made that "Get to Know You" survey and one of you readers will be especially glad because you won $25 in Amazon.com gift cards (that didn't cost me a cent, as I earned them via Swagbucks). Since this was all about getting to know you, I'll tell you a little bit about Becky. You've probably more frugal than most of your peers. Your friends probably wonder how you manage to keep your expenses so low. Even so, don't risk complacency. You're halfway there to being a Frugalista Extraordinaire. You've come far already, and if you keep at it, you'll probably get your finances in order in no time. Random fact about me Is I have two huge dogs in my tiny 986 sq ft house. 120+ lb Saint Bernard and another Great Pyr mix. 2 kids and 2 adults. Very crowded. Random fact 2 is that I canned peaches for the first time yesterday and loved it and can't wait to do it again. Saving money and buying local. And the winning comment: Random fact 3 is I love to take the kids hiking but I am so out of shape and I'm scared of heights so it takes a lot of work but I do it. Use the money in good health, Becky! Becky will have 48 hours to respond to my email or I will be choosing a new winner. So reader, what did you think about that getting to know you survey? Do you think that you fit into the typical reader from my blog?